Life comes with its trials, circumstances that could bring us to our knees but could also strengthen us for the journey ahead. The hope is in knowing that God is in control of those trials, encouraging us to walk by faith in Him and not by sight. 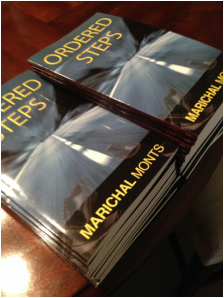 The new book by Marichal Monts, Ordered Steps, draws on every Christian’s chief focus in life, discovering our purposes in life and callings in God’s ultimate plan. Marichal uses stories of his personal testimony to show that he has been in the shoes of each reader, worrying over the path ahead but realizing God directs the steps. He promotes embracing an eternal perspective towards life, one that relies on the steps ordered by the Lord and having confidence that God will work everything for good. Everyone goes through seasons in life, but knowing God has ours paths in hand will bring divine peace.